Friday, 29th June, 2017. 10am. Golau Caredig Restaurant, Barry. CF62 7AJ. Professor Baroness Ilora Finlay will be the next guest of Barry Arts Festival’s Talking Points series, speaking at 10am in the Restaurant at Golau Caredig (the former Theatre Royal), Broad Street, Barry on Friday, 29th June. 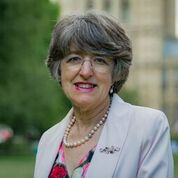 A professor of palliative medicine at Cardiff University, crossbench member of the House of Lords since 2001 and former Welsh Woman of the Year, Baroness Finlay is also vice-president of Hospice UK and Marie Curie Care. “Baroness Finlay has been one of Wales’ foremost campaigning public figures for many decades, and we look forward to hearing her speak about her work in research and at the House of Lords. “Her work in palliative care, care for those who are terminally ill, has made a huge difference to many families in Wales over many decades, and she has been hugely influential on public policy as co-chair of think tank Living and Dying Well and serving on the Select Committee on Assisted Dying for the Terminally Ill.
Barry Arts Festival would like to thank Barry Town Council and Newydd Housing Association for their sponsorship of the Festival, which is now in its seventh year.